Sure, it’s February and the silly groundhog just predicted an early spring, but as far as I’m concerned, Christmas has finally arrived! 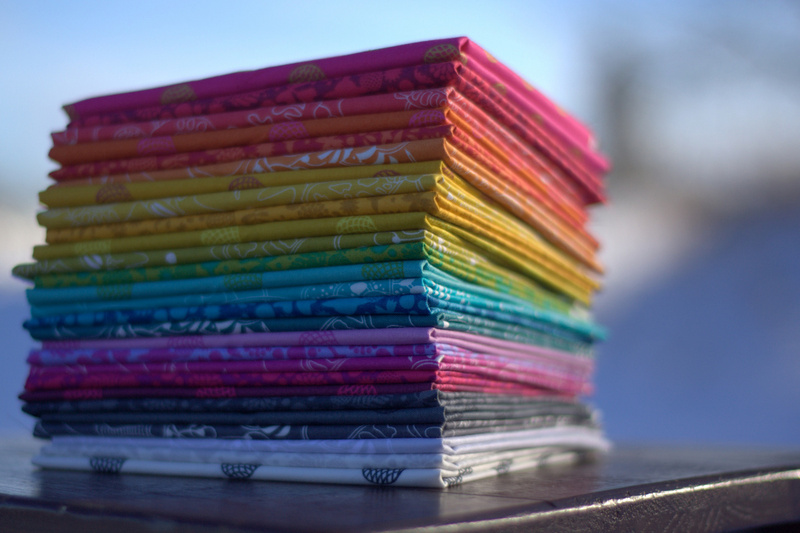 In the past few days we not only got our first solid snow of the year, but I also received my Christmas gift from Santa–fat quarter bundles of Alison Glass‘s full Sun Prints 2016 collection for Andover. I’m so glad I had the foresight (and patience) to preorder these Sun Prints, since even though I didn’t have them to unwrap under the tree, they are well worth the wait. 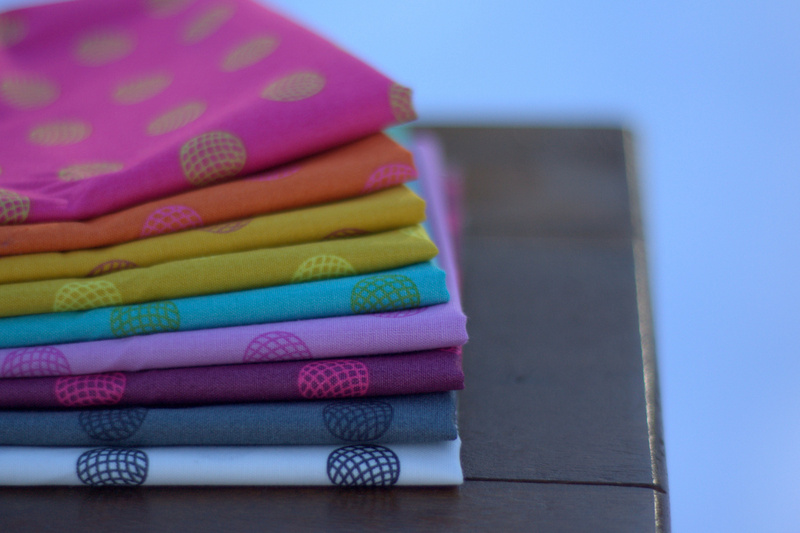 The Sun Prints 2016 collection includes new lines Sphere, Grow, and Endpaper. It probably comes as no surprise that I love them all. I took them all out into the fresh snow for a photo shoot with a new camera lens, a 50mm 1.8f lens that was a Christmas present from my awesome husband. While I love this lens, I definitely should have taken these photos with a deeper depth of field. I’m still getting a feel for it. 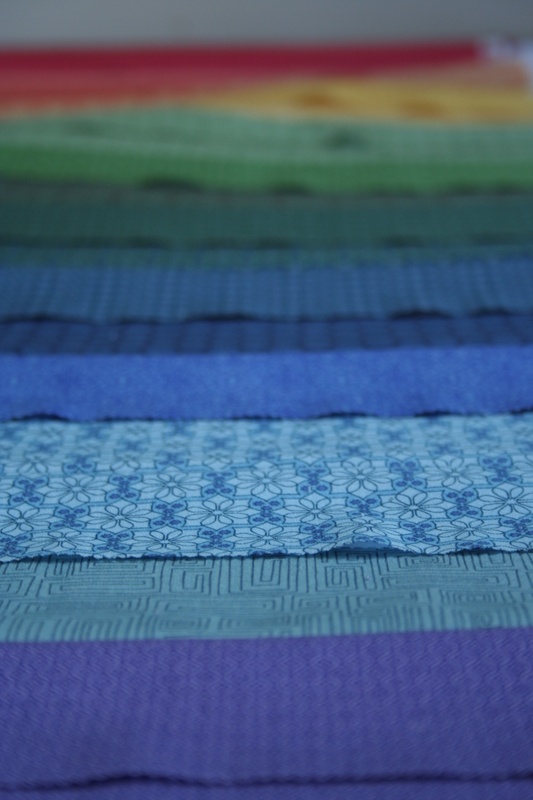 For now, here are the way up close, pinpoint focal point photos of these gorgeous fabrics. I’m not typically a polka dot fan, but there’s something about Sphere that grabs me. Perhaps it’s the fact that these dynamic little bulbs remind me of the earth with latitude and longitudinal lines. Perhaps it’s the fact that the sphere colors help blend the fabric lines together subtly and flawlessly. Either way, it joined the ranks in my AG stash. Grow is a design that also appears in Abacus, with charcoal on white. It was one of the first Abacus prints I bought and I cannot wait to embroider on it. The Grow Sun Prints let us use the gorgeously sketched botanical design in a full spectrum of colors. 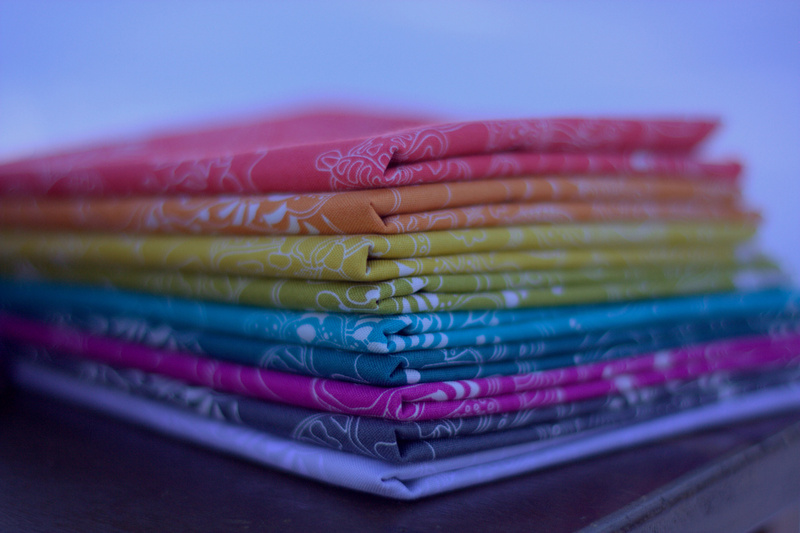 Endpaper is the epitome of my favorite types of fabrics. I love tone on tone blenders, and endpaper nails those categories. The colors are rich and deep, and include my favorite tertiary colors. These three new collections blend beautifully together when combined. 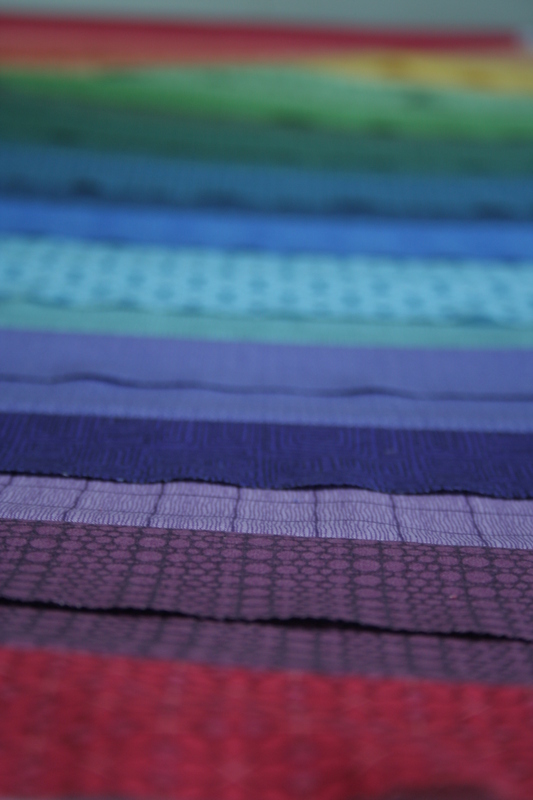 I love the subtle flow that emerges between fabrics and colors. 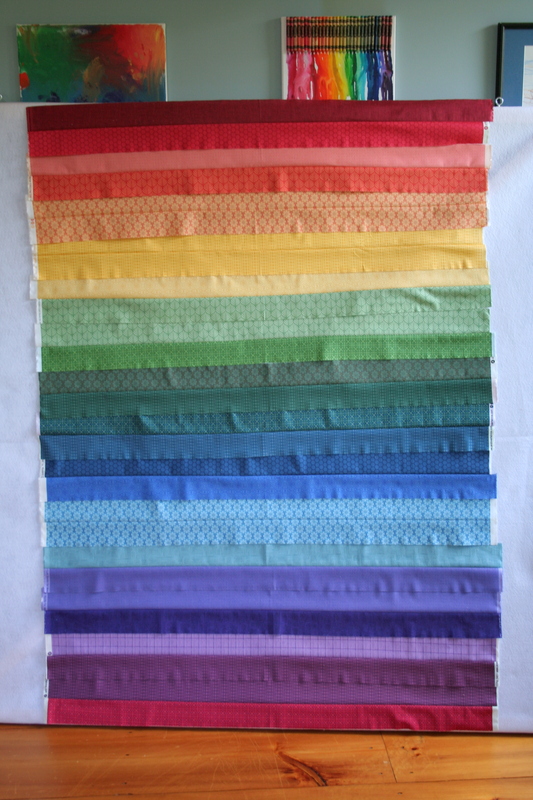 Every time I finish another rainbow project, I think maybe it’s time I explored other color combinations. But really, how could I not create with these? I have a feeling you will be seeing quite a few more rainbows in the not too distant future! 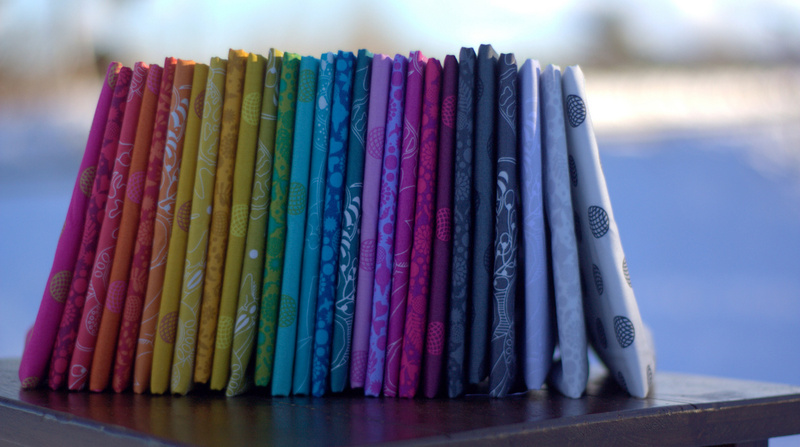 I also recently saw that my local quilt shop Fiddlehead Artisan Supply is stocking the full Sun Prints 2016 collection, and has it all shelved with some of Alison’s older Sun Prints and other fabric lines. It’s glorious! 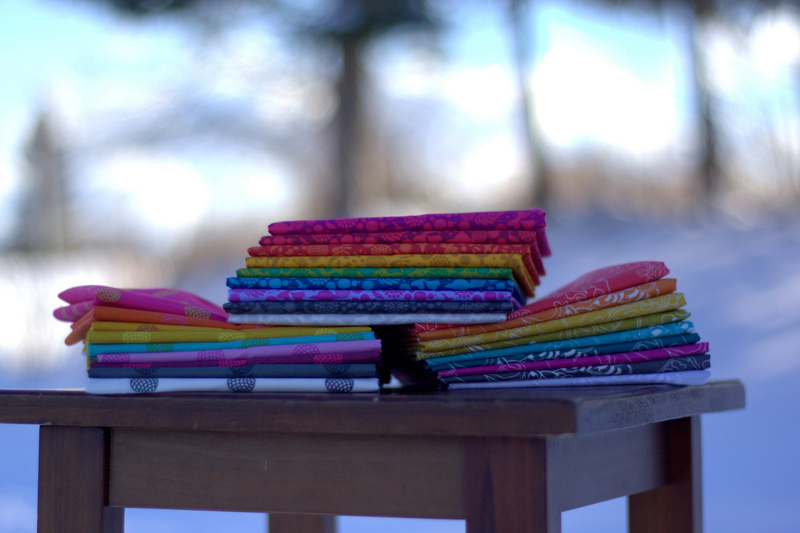 If you’re local (or an online shopper), you can get your rainbow fill, too! 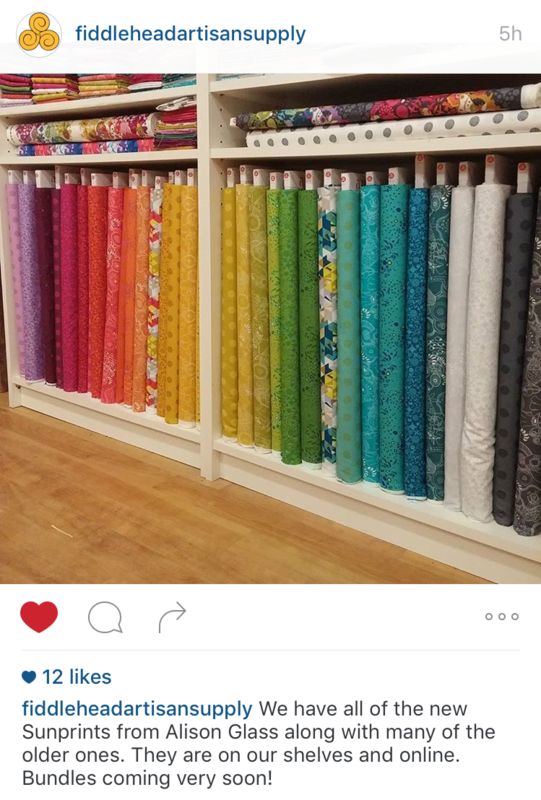 I’m sharing a screenshot I took of Fiddlehead’s Instagram feed so that you can revel in the rainbow gradient beauty, too. Sooo good. I’m linking up with Molli’s Sunday Stash. It’s been a while, but I have a lot of stash additions to share. 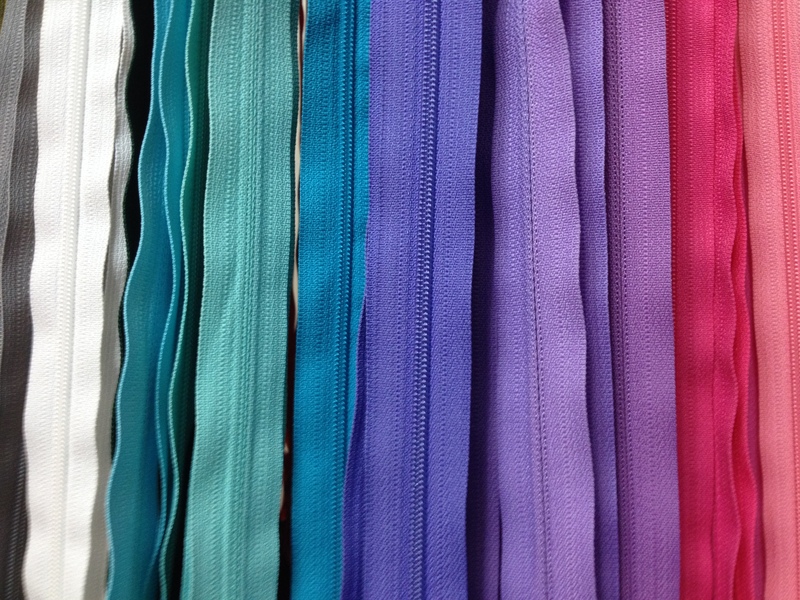 It seemed only right to begin with the newest and most gorgeous fabrics! This shop is by far the largest, most thoroughly stocked shop I’ve visited to date. It is HUGE! And has everything!! 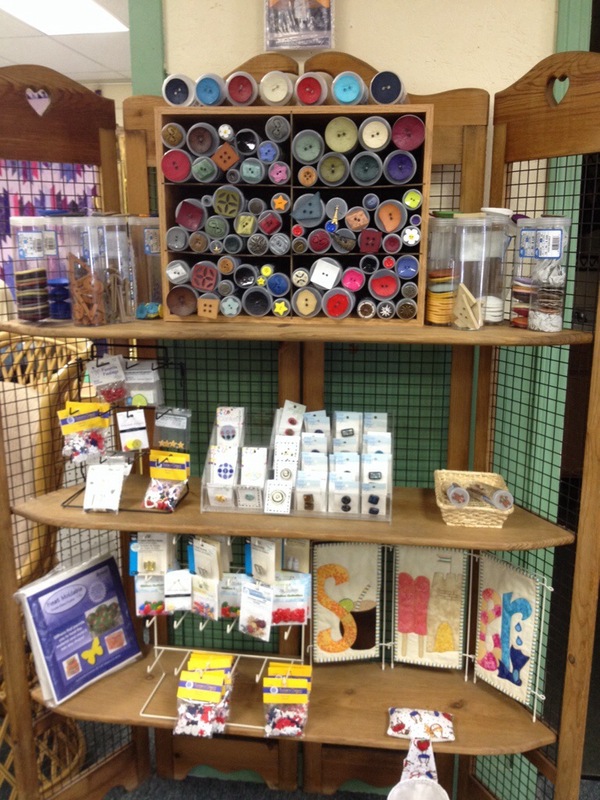 The Cotton Cupboard Quilt Shop has a large selection of Bernina sewing machines, notions galore, cutting mats of all shapes and sizes–even the rotating mats!, buttons, an extensive variety of books and patterns, kits, and they have a Block of the Month Club and offer classes. And their fabric! 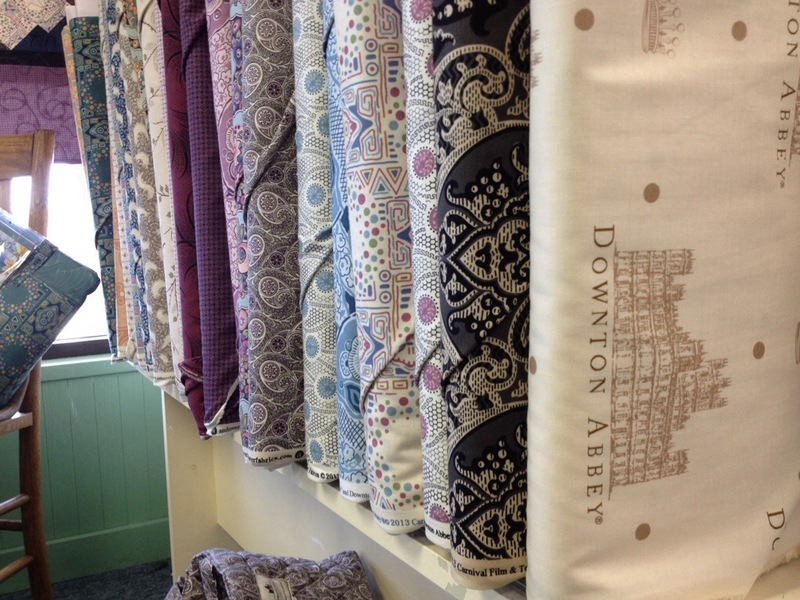 Cotton Cupboard has a huge stock of traditional quilting fabric, MANY gorgeous arrays of blenders and tone on tone fabrics, nature-print fabrics (think stones, grass, leaves, etc), a selection of children’s fabric, the entire Downton Abbey fabric line by Andover Fabrics (swoon! ), and more. The one thing they don’t have is modern fabric. In talking to Evelyn, she said they’ve tried stocking modern fabric in the past but not enough folks were buying it to make it worth stocking. 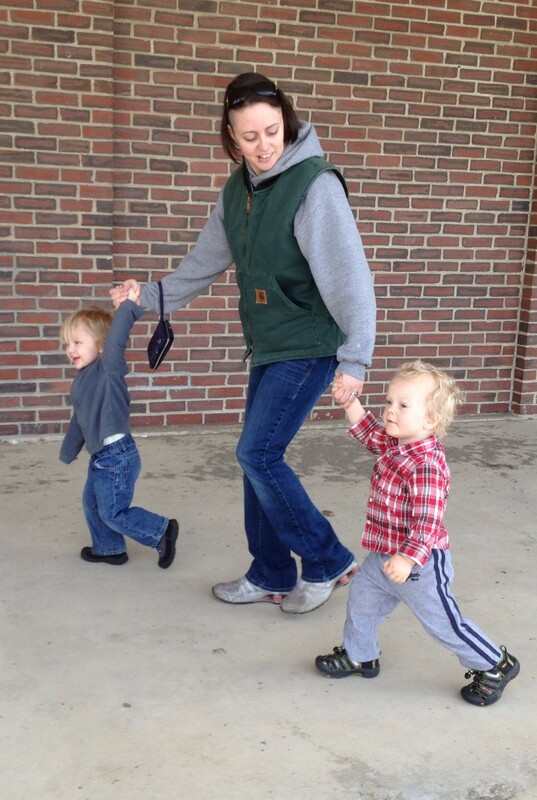 Emily and the boys getting ready to browse. 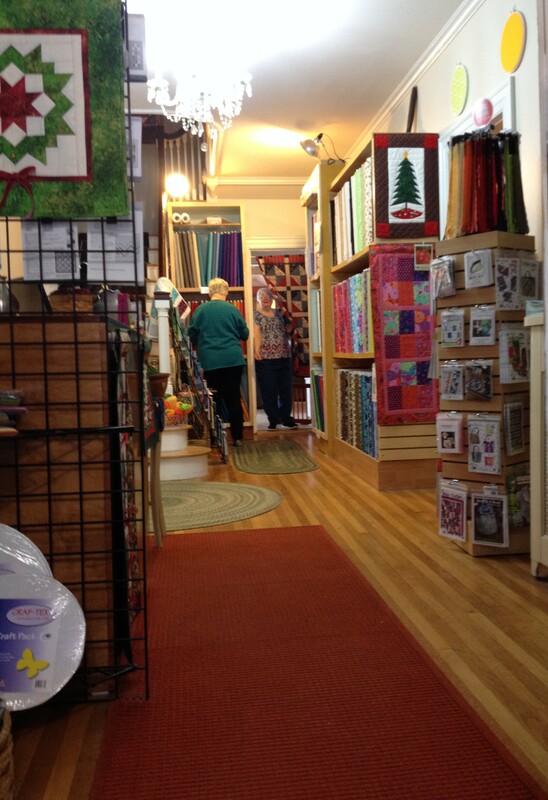 This shop even had Art Quilt Boards, which I had never seen before. 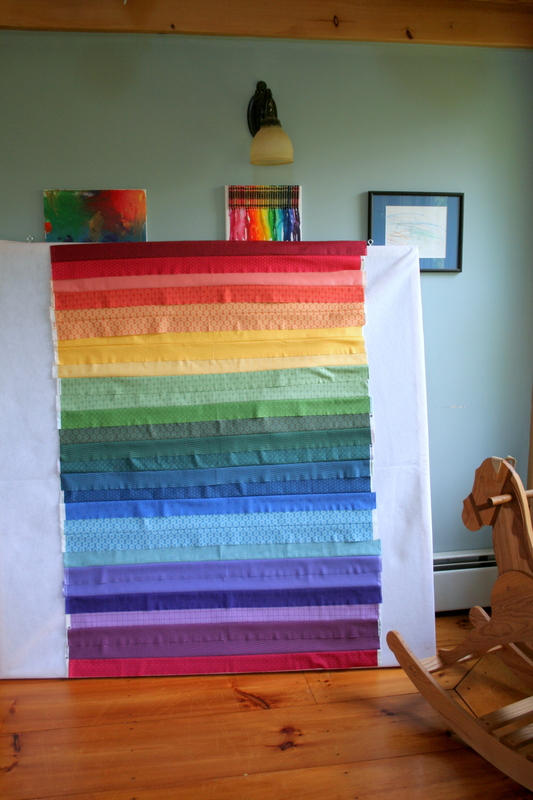 These would make great quick gifts, or even fabric projects for kids. Location? 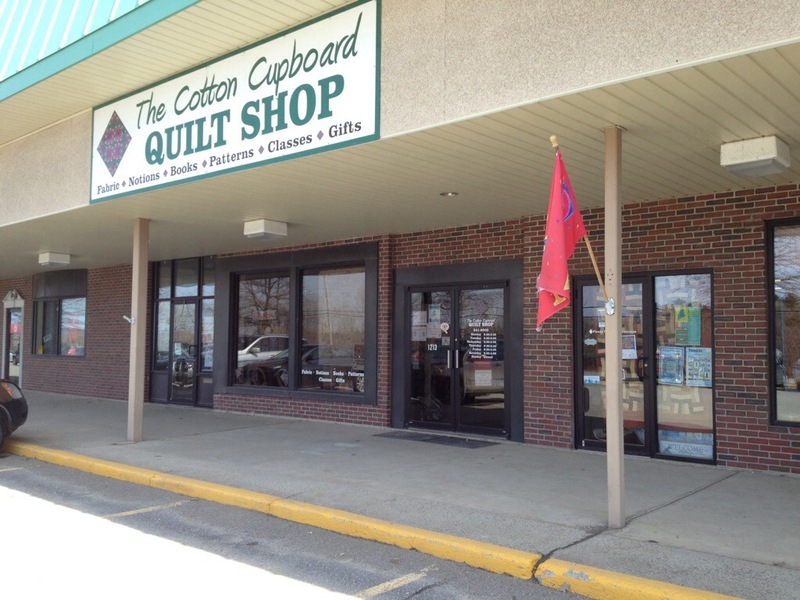 The Cotton Cupboard Quilt Shop is located right on Broadway in the Judson Heights Center (next to The Growing Place). While it’s not in the center of downtown, it is on a road full of shopping centers and other hot spots. For the ice cream lovers, it’s just a skip, hop, and a jump away from Giffords; that alone makes it worth the trek out Broadway to visit the quilt shop and get some ice cream! 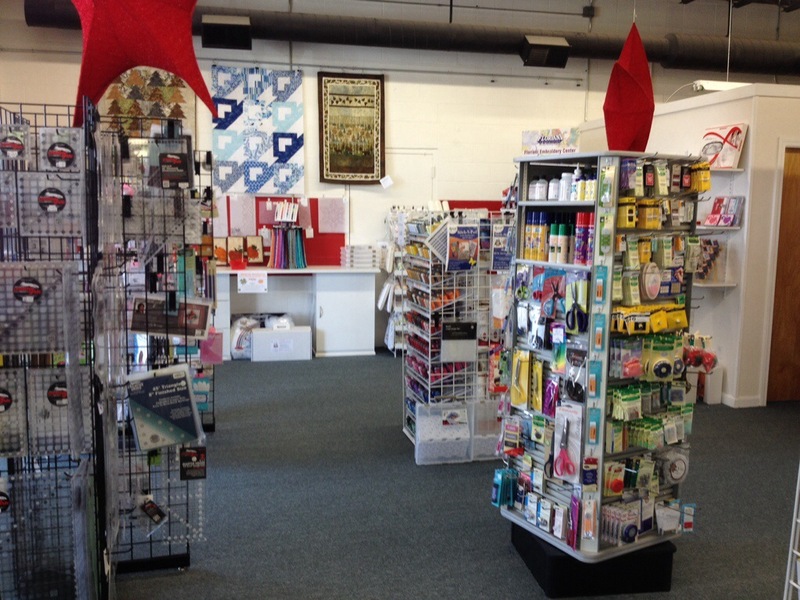 There is a parking lot with ample free parking, and the store is easy to find. Sells? 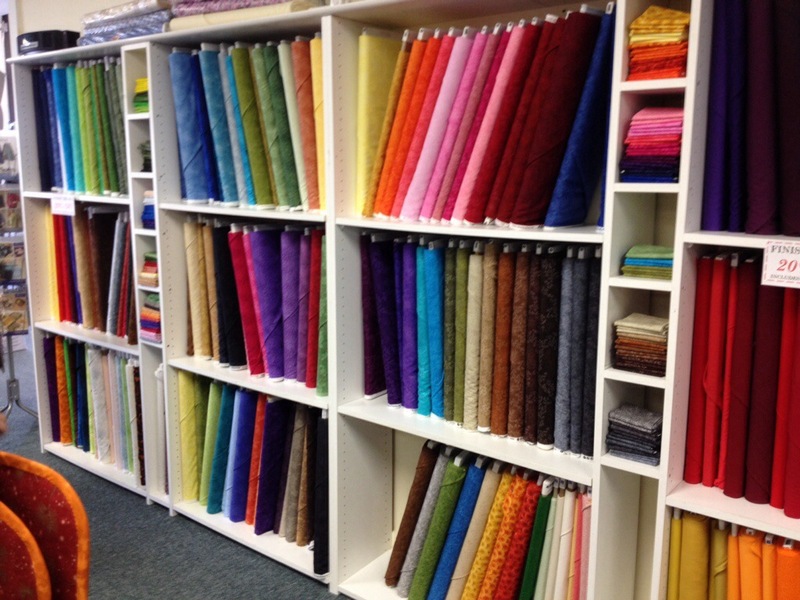 A large selection of traditional quilting fabric, notions, Bernina sewing machines, books and patterns, and offers classes and workshops. They are a Bernina dealer, with classes specifically tailored to learning to use your Bernina machine. Modern or traditional? 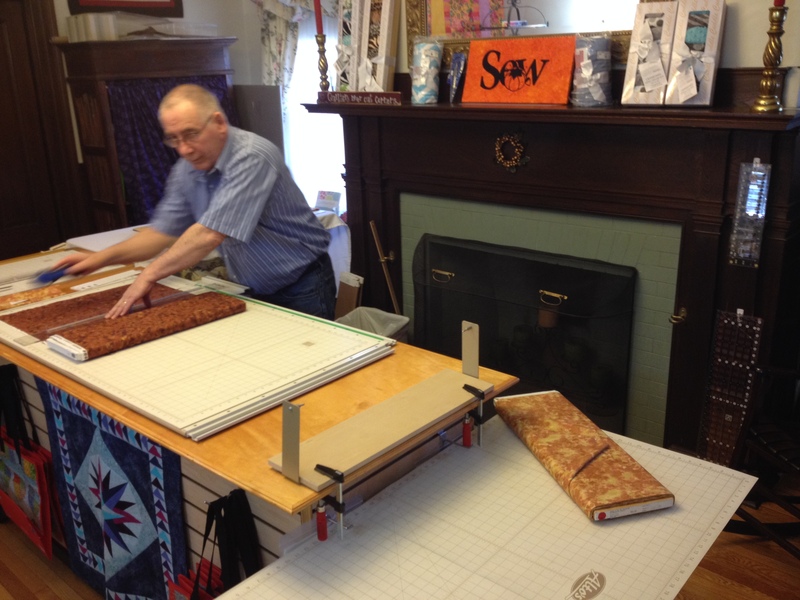 Traditional, since apparently the modern quilting world hasn’t made its way up to Bangor yet! Swag? 5″ charm square of Shop Hop Theme fabric, free fat quarter, coupon, and a fun sized candy treat. Kid friendly? Not really. This store is so large, it’s hard to keep an eye on your kids, at least when they are toddlers. Evelyn said they try to be kid friendly, and are open to kids in the shop, but she worries mostly about all the sharp objects. I agree; I worried that with the ubiquitous sewing machines and aisles and aisles of fabric that Max would bolt (pun intended! hah) and find his way to something he shouldn’t before I could catch him. 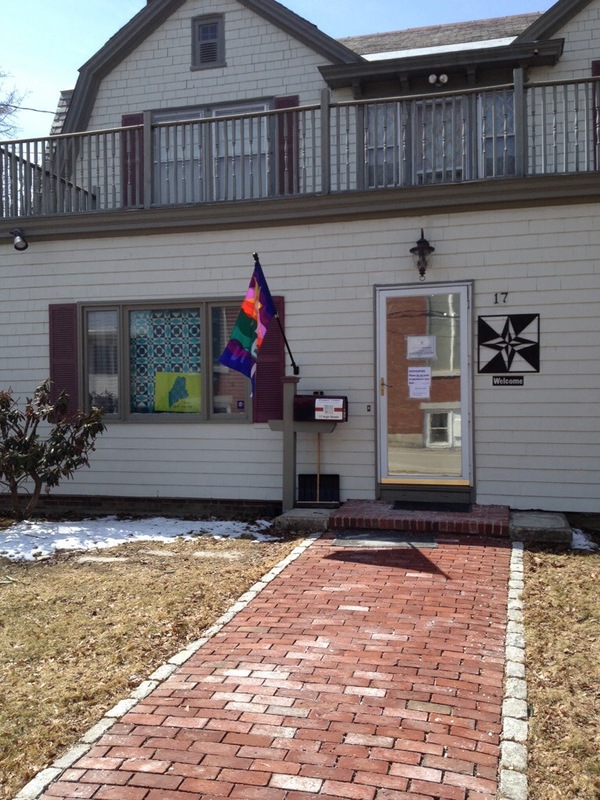 Choppin’ Cotton is an adorable quilt shop right in a lovely home. Since my son was especially squirmy in this shop, I didn’t get a chance to ask whose home it is. 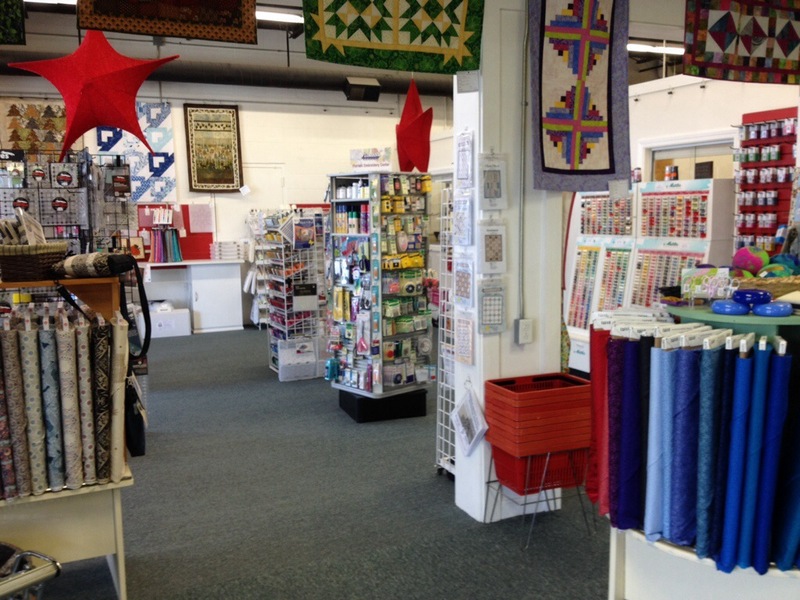 They sell a wide range of traditional quilting cottons, notions and quilting tools, patterns and books–including some modern quilting books!–and they offer workshops as well. I loved the ambiance of the shop, even if it wasn’t especially toddler friendly. I am eager to go back someday sans kids so that I can truly browse. Walk right in through the front porch and into the main hall. Admire the crystal chandelier. 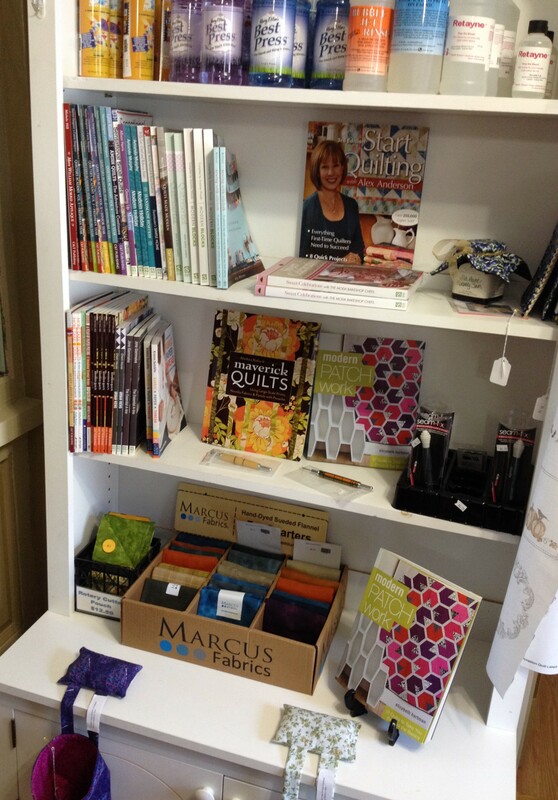 Some of their books, including some Modern Quilting options! 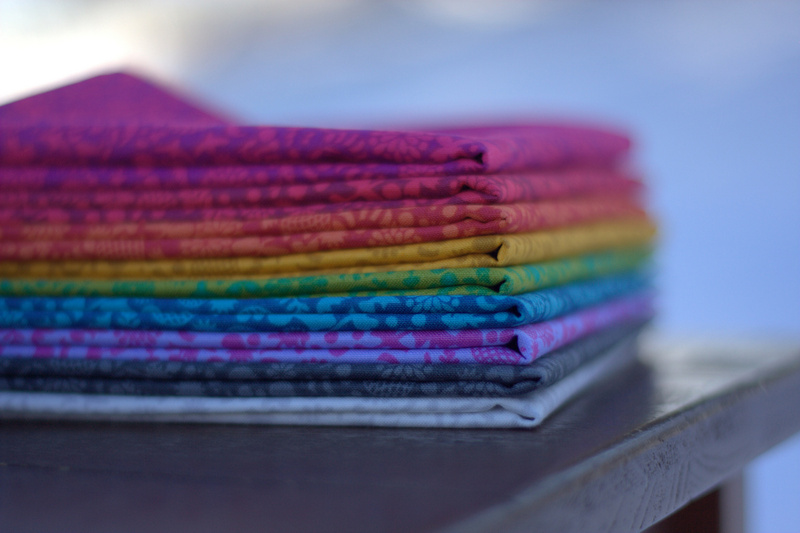 Colorful batiks and blenders… beautiful! The cutting table is right in front of the mantle and fireplace! The shop sported a homey quilting decor with many signs that made me smile, mostly related to never having too much fabric. “Your husband called; he said buy whatever you want.” “To quilt or not to quilt: What a silly question!” and similar signs. While looking around, I often would pause on a sign and have a good chuckle. I also appreciated the reminder behind the check out counter: “I have a difficult time remembering my Grandchildren’s name, so please remind me of yours.” Being in a home with the kitchen behind a curtain just beyond the entry, next to a staircase leading up to living quarters, paired with the homey signs and decor and friendly conversation made this shop especially relaxed and welcoming. I’m looking forward to going back the next time I have a free moment in Bangor. Location? Located on High Street, right off of Hammond Street, Choppin’ Cotton is walkable from downtown Bangor as long as you aren’t afraid of a good hill. Since it’s in an actual home, it’s on a residential street with street parking. I did not notice whether there is additional parking, but there were plenty of free street parking spots. Sells? 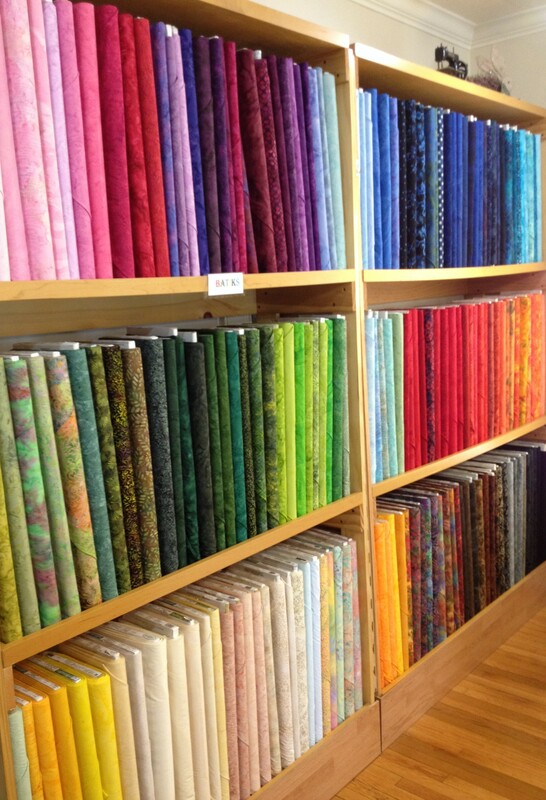 Traditional quilting fabric, notions, books and patterns. According to their website, they specialize in Alto’s QuiltCut2 quilting tool systems. Modern or traditional? 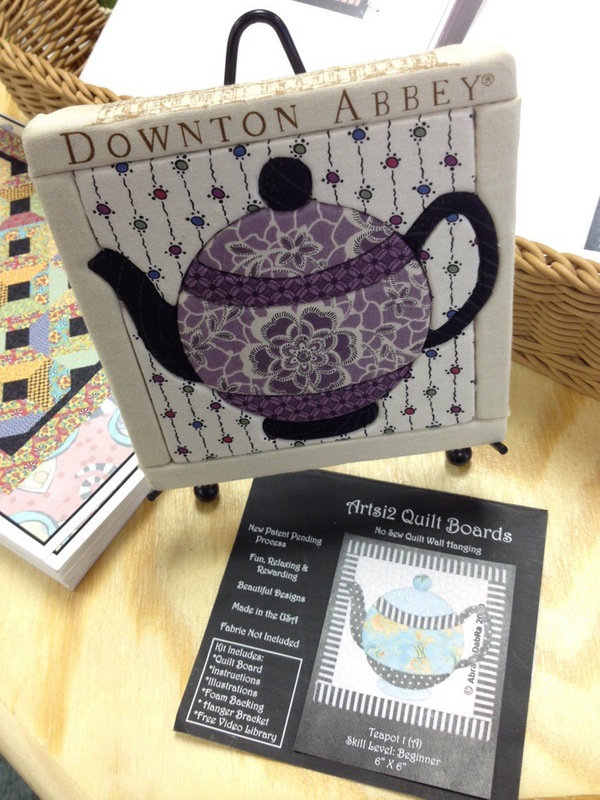 Traditional, but with Modern Quilting books available. Swag? 5″ charm square of Shop Hop Theme fabric, a Tooltron Fine Sewing Brush, and a fun size candy snack. Kid friendly? No. Because the shop is in a house, there is less open space, and multiple rooms into and out of which kids can run and dart to find trouble. Eloise was very friendly and understanding about our fussing kids, but I still felt that tell-tale rush of blood that triggers the fight-or-flight reaction when Max was especially fussy. 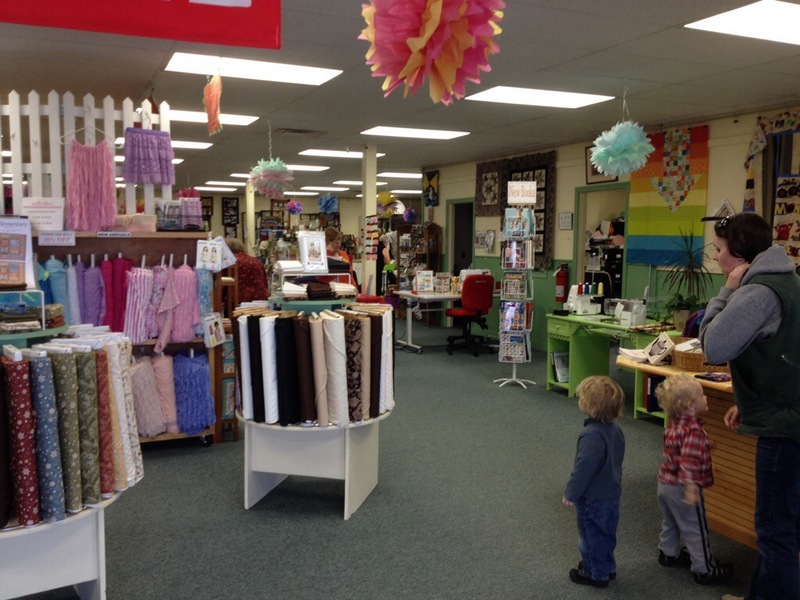 In writing these, especially on an wildly rambunctious day like today, I realize that bringing a toddler into a quilt shop is rarely a great idea. Sometimes, though, it is the only option. Having a “safe” corner with a pouf and a box of books and toys really makes or breaks a successful fabric shopping trip on those days. So who’s going to be the genius who opens a quilt shop with an attached playroom or ball pit?! That would be heaven!